software solutions. From inventory to accounting to maintenance software, Chetu has it covered. Our custom farm management systems include modules for crop management, food safety reporting automation, labor management, field management, accounting platforms, order processing applications, and machine maintenance tracking. We create custom analytics dashboards to manage business operations and create database solutions for custom query and report creation. We develop field operations and labor management systems to track and manage employees with scheduling, reporting, and tracking capabilities, and integrate with common employee management systems. We also develop greenhouse farm management software for high volume growers of flowers, vegetables and fruits, enabling automation of watering, irrigation, planting optimization, and data analysis. We develop grain and produce tracking applications that manage inventory and storage reports across multiple locations and silos, automate reporting to agencies, ensure traceability requirements are met, and create seamless documentation for inspectors. We also develop crop management applications, including field planning and rotations management, crop databases, yield management, and events tracking. Our expert team at Chetu creates mobile Agriculture (mAgriculture) applications, including equipment management, weather monitoring, inventory alerts, and automatic asset location, accessible from any mobile phone or tablet. We program custom agro-processing software platforms to manage traceability requirements and automate labeling processes for nutritional values, allergy information, and ingredients. We engineer farm management software solutions for farm-to-fork traceability, including integrations with third-party applications to track raw materials and ingredients, and ensure compliance reporting with quality control measures. We develop food safety applications to ensure reporting to oversight agencies, including the USDA. We integrate with microbiological detectors for pathogen identification, and create databases for material safety data sheets. We program contract and supplier management software systems, with integrated modules for procurement, sales contracts, standardization of terms, and regulatory compliance automation tools, designed for seamless and efficient collaboration. We also integrate supplier management software platforms and user portals with third-party apps, to expedite ordering and reordering processes, manage supplier invoices, and track shipments. Our expert team at Chetu develops applications to automate order processing that efficiently manage and streamline workflows, from order receipt through fulfillment. We integrate with Enterprise Resource Planning (ERP) platforms to update inventory management systems. We also program pricing management portals that integrate and update with real-time markets, for dynamic pricing capabilities and automated order management. We develop agribusiness customer management software applications with agri-marketing capabilities and CRM data integration. These apps streamline business operations, automate marketing practices, and grow customer bases. Our custom software development for farm accounting systems and financial management includes integrations with third-party accounting software (QuickBooks, Quicken, etc. ), and custom modules to calculate profit and Cost-of-Goods-Sold (COGS). We program farm warehouse inventory management for materials planning, automation protocols, order fulfillment, and complete supply chain visibility, including firmware solutions for RFID systems, barcode scanners, serial number identification scanners, and more. Our inventory management and fulfillment software assists in reordering optimization, with automated economic order quantity (EOQ) calculations based on predetermined minimum and maximum levels. Our Machine-to-Machine (M2M) communications software contains sensor equipment (including remote sensors), tractors, combine harvesting machinery, unmanned aerial vehicles (UAVs), and soil sampling machinery for efficient planting management. We also program custom machine maintenance apps, including maintenance scheduling and tracking, Overall Equipment Efficiency (OEE) monitoring, risk and downtime management, and safety management. We program farm inventory management software for automated expiry dating, lot tracking, and serial numbering capabilities, plus packing software modules to ensure orders are packed efficiently, and with appropriate labels. Also, our waste management software solution includes integration with inventory management expiry dating, along with alert notification automation. We optimize machinery performance across multiple locations, with software-for-hardware (firmware) solutions, and machine data integration with field equipment, livestock management equipment, grower equipment and all other farm machinery. These solutions also include integration with data warehousing solutions, to capture and store information for analysis and compliance records keeping. Our farm equipment inspection software development includes mobile apps for in-field inspection and reporting capabilities, standardization of inspection protocols, seamless transfer of data to outside oversight agencies, and data backup and storage to ensure compliance. We also create software for driverless tractor technology, and seamlessly integrate with GPS satellite networks for enhanced communication and control. Our team at Chetu creates firmware integration with remote sensing equipment, including soil, irrigation, and weather devices. These integrations include custom dashboards with real-time displays. We also engineer geolocation data reporting software, which tracks equipment and assets in real-time across multiple fields using GPS, RFID, and other Electronic Identification Devices (EIDs). This software ensures complete control of farming activities from one system. 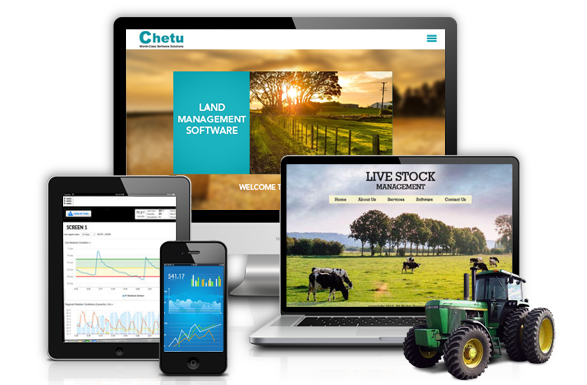 Chetu's agriculture software development, integration and implementation experts comply with regulatory standards set by the U.S. Department of Agriculture (USDA), Food and Drug Administration (FDA), Food Safety and Inspection Service (FSIS). We also comply with the Environmental Protection Agency (EPA) and their two permit and reporting programs: the National Pollutant Discharge Elimination System (NPDES) and the Greenhouse Gas Reporting Program (GHGRP).